I'm an artist and bike nut. As a cycling advocate, I write a blog art.spoke.soul. which brings together my passions of creativity and bicycles. I'm planning an event for Cardiff Cycle Festival 2012 which showcases a group of artists across a number of venues in Cardiff. 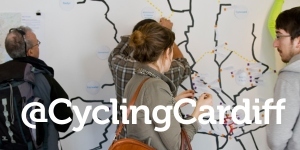 I'm leading the Sustrans canvassing team for the next few months to develop personalised travel plans for anyone that would like more information about positive changes they can make to travel more easily around the city.